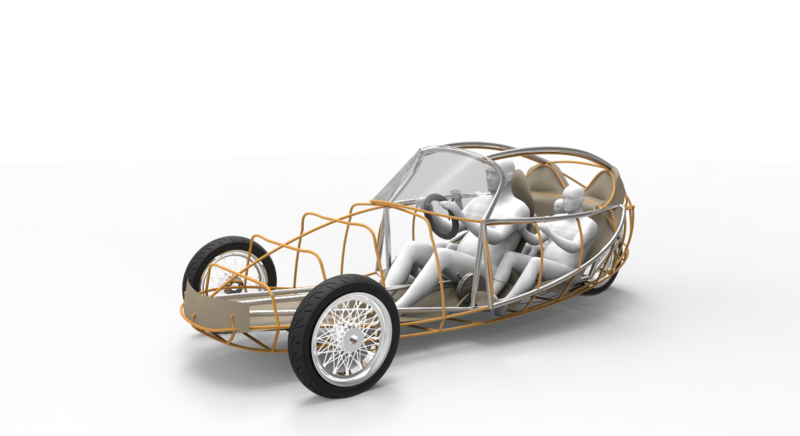 Greenolution Oskar – open source vehicle concept – human hybrid vehicle from suurmeijer on Vimeo. An analysis of the needs of the target group and the context of use resulted in the conclusion that families in the city need a vehicle that feels like a home, but then outside: the garden. A garden is a place full of paradoxes: it is semi-open, semi-home, both relaxing and playful. The translation of these values to a vehicle concept lead to a vehicle that is more closed and safe than a bicycle but not to that extent that it fully disconnects its passengers from its environment, like a car. The Spandex skin only makes a very thin division between inside and outside and the openable roof makes interaction with the city possible if the passengers want to. The material use of the vehicle, bamboo with a skin, is a clear reference to garden furniture. 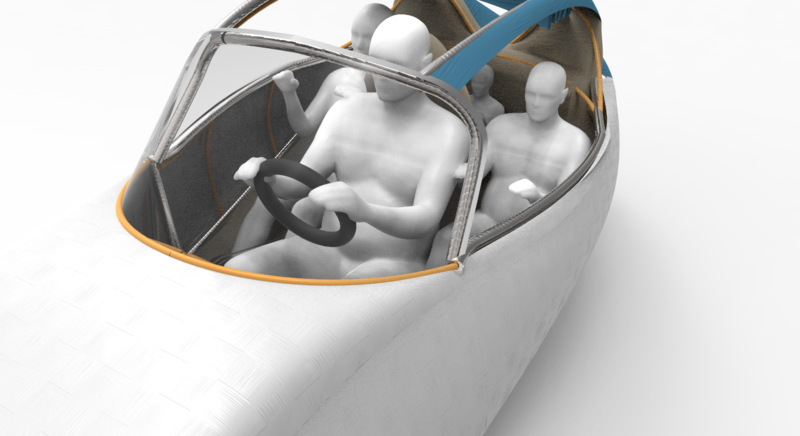 The energy games and the seating position play even more with these values, so that the vehicle becomes a place where it is fun and safe to be. Why not play with the fact that the vehicle is both allowed on bicycle paths and roads for cars in the city? 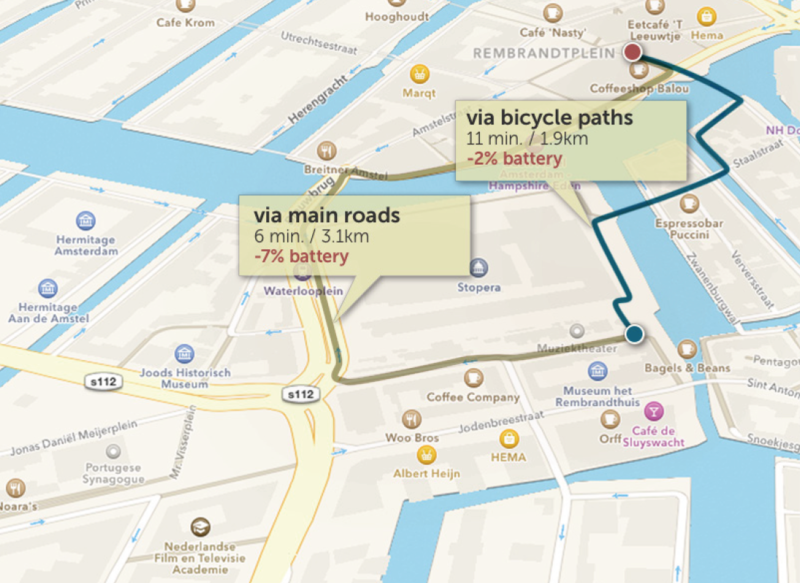 Finding the right route through the city becomes a real challenge this way, because choosing for the fastest way will use more battery, while choosing the (maybe shorter) way by bicycle paths are viable through pedal power. Driving the vehicle becomes a game of finding a balance between different energy sources and consumers. And with pedal power, an empty battery never is a problem. The energy games is not just about routing or going where other vehicles can not but also about generating energy together. Children are often full energy and sporting together is fun, so why not use the travelling time to sport together for that little extra speed? Besides that, children learn that energy is not something that ‘just’ exists. Oskar has a 1+2+1 chair setup, of which the first three chairs can be used by adults and of which the third chair is meant for children younger than 6 years or luggage. Oskar enables the first three passengers to engage in pedalling and thus in driving more economical. The driver sits slightly more up front in the vehicle to enable him/her to focus completely on the traffic if necessary. The driver is fully in control of the vehicle: he determines the speed by setting up the amount of support his pedalling gets from the motors in the wheels, he can steer the vehicle and is able to brake. For a family vehicle in a dangerous urban environment, safety really is a very important issue. Oskar has in a strange position in the city, since there is traffic that is bigger than Oskar and traffic that is smaller. This is why Oskar has several layers of protection, of which the Spandex skin is mainly directioned to the outside, for pedestrian safety. The Bamboo bones have two functions: on the one hand softens it the collision of a pedestrian (directed on the outside). On the other hand does it work like a spring when crashing in a bigger vehicle. The third layer, the steel cage, is mainly directed to inside safety of the passengers providing the stiffness needed to protect them.